Classical music, art and cinema all have their place and are often given the respect they are due. So it is with the Western. Some of America’s greatest fables and folktales exist in the Western genre. From the gunfight at the OK Corral to Tombstone to Butch Cassidy and the Sundance Kid all of these tall tales have been told time and again in the classical Western form. But it was in the 1960s when European cinema was in a golden age and the Italians had embraced genre that the Western truly began to come into its own with Sergio Leone’s The Good, the Bad and the Ugly. The film’s violence while not especially gory or bloody still has the ability to shock thanks mostly to longshots and close-ups combined with Eugenio Alabiso and Nino Baragli’s masterful editing. Blondie’s mowing down of Tuco’s compadres in a hotel room followed by Tuco’s entrance through the window happens in under two minutes. Leone draws us in with the promise of violence, building up an atmosphere and winding tension until the viewer’s teeth are on edge before letting it all loose in the space of seconds. This technique is drawn from the likes of Akira Kurosawa’s Samurai classics Yojimbo and Sanjuro. A great deal of the characters in Leone’s Dollars trilogy as well as Once Upon a Time in the West wear their guns like swords. Just look at the likes of The Hateful Eight, Reservoir Dogs, Bone Tomahawk or Django Unchained; Leone’s influence is plain to see. Tarantino owes a great deal more to Sergio Leone than he does to Jean Luc Goddard. The cynicism and at times nihilism apparent in The Good, the Bad and the Ugly is there for good reason. Recognising the classical idea of Westerns as historical lies was an important move for the likes of the Spaghetti Western genre. Realising that the characters in My Darling Clementine and Stagecoach were most likely racists with scurvy and syphilis is what makes the Spaghetti Western an important part of American history. The film looks at the horrible cost of the American Civil War; it’s cost on civilians, on soldiers and on the landscape. Never has the very soil and air of America looked or felt so empty. Sergio Leone shot the film in a sweeping, panoramic widescreen style designed to capture the savage beauty and aching emptiness of the southern American deserts. Important also are the polar opposite extreme close-ups Leone used in the final stand-off scene. The camera jumps from face to face never missing a detail from Blondie’s cigar-chewing concentration to Tuco’s obvious nervousness and Angel Eyes’ controlled calm. It’s in quiet moments like these that the film succeeds. I say quiet I really mean no dialogue. The poor dubbing of English onto Italian actors and vice-versa means that the lip-syncing can often be quite distracting and laughable in scenes heavy with dialogue. Moments of silence are rare in The Good, the Bad and the Ugly. Ennio Morricone’s main theme often comes in like a screaming wind through a canyon. Designed to sound like the corpses in the cemetery are laughing in the final shoot out the iconic screeching of human voices, flutes and ocarinas mimic coyote howls. Elsewhere more typical yodeling and orchestral strings emphasises the beauty surrounding the madness of the chosen time period. A separate instrument is used for each character emphasising the many subtle and few extreme differences between Blondie, Angel Eyes and Tuco. A screaming choir marks Tuco as unpredictable while a flute assures audiences of Blondie’s natural calm while ocarinas mark out Angel Eyes as the most sinister of the trio. Fitting then that 48 years later Morricone would win his first Academy Award for The Hateful Eight, a Western that further revised the genre. The Good, the Bad and the Ugly is one of the most influential films of all time. 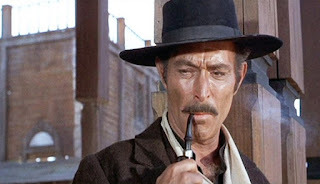 Lee Van Cleef’s moustache has more threat in it than I have in my little finger. Clint Eastwood’s Man With No Name character has been seen in everything from Shoot ‘Em Up to Star Wars. The Good, the Bad and the Ugly characters are the cover photo on the HeadStuff Film writers group page on Facebook. Leone’s classic can be seen everywhere from Korean parody The Good, the Bad and the Weird to video games like Red Dead Redemption . It defined the characters we’re so used to now: the pure evil villain, the silent rogue with a heart of gold and the fast-talking sidekick. Without The Good, the Bad and the Ugly everything would be Sad, Bad and Mad.